Does your church use name tags during the Sunday morning worship service? 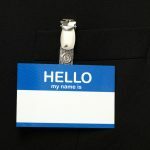 Several church growth books recommend name tags as one way of increasing the friendliness or openness of a congregation. I’m not going to say you need to do one, but if you want to implement a church name tag process, you don’t want to do this half-way. When people visit conventions, or large meetings at hotels, name tags are part of the routine. When social clubs get together where there are potential new faces, name tags help break the ice. Name tags in churches are not too far out of normal. As commented on yesterday’s post on church name tags, one may need to consider if this makes your church feel like a business seminar. Some may choose to use this in their congregation as conversation starters among members and guests. 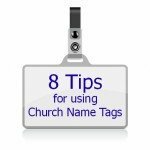 Today, let me give you two reasons to consider using name tags in churches. The choice is yours, I’m not telling you one way or another. 1. Name tags invite people to greet one another. Perhaps your church attendance on a Sunday morning is large enough where not everyone can know everyone else’s name. Church branded name tags can help create a sense of community. One church sometimes prints a question at the bottom of the name tag that is used at greeting time during the service, such as “Turn to your neighbor and ask them about their favorite teacher in grade school.” The choice of question is not random – it will often connect to an illustration during the sermon. In other words, name tags can be conversation starters. Read: How many relationships are you missing out on because you don’t know people’s names? I regularly read Scott Ginsberg (“That guy with the Name tag”). He’s written several excellent posts and much of his material can be useful in your church. “The larger the congregation, the more important it is for all members to wear name tags every Sunday morning. One reason is to help members know one another by name. A second reason is to help members identify and welcome visitors. A third reason is that name tags have important symbolic value. They symbolize the acceptance of the fact that this is a large congregation that expects strangers to be present every Sunday, and the regular use of name tags represents a ‘Welcome, stranger! This is my name’ attitude by the members.” p. 20. 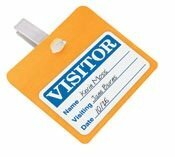 Some churches will monitor their name tag boards / baskets for attendance tracking. A volunteer will make note of who attended or who didn’t attend that Sunday. Churches with multiple points of entry and multiple services may not be able to do this, but for a majority of churches that have just one main entrance, this may be easy to do. Some will ask members to put their name tag in a special basket after the service (assuming they use pre-made ones). A volunteer will gather them for attendance tracking and note who is missing. This provides opportunity for member care. There are other methods of church attendance tracking, but some smaller size churches may choose to use this. 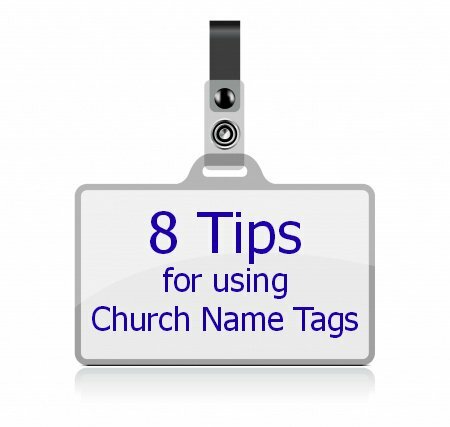 If you use name tags in your church, what benefits are you seeing? If you are evaualating the idea, what are some benefits your discussions are revealing? What about reasons why not? Share your thoughts in the comment field below. Dry-Erase pens have less odor than permanent markers. Some users report that stick-on nametag labels from name brands are a somewhat better for this purpose than chain store brands, but the latter are less expensive. Some organize preprinted nametags by small group to help facilitate member care by small group leaders. If you have multiple points of entry, have an area at each entrance where people can pickup and return their name tag. One church color codes their name tags by number of years being a member. I personally think that’s a bad idea. Do not make visitors stick out as the only ones with name tags. This should be an most-everybody level of involvement (some will never wear one). 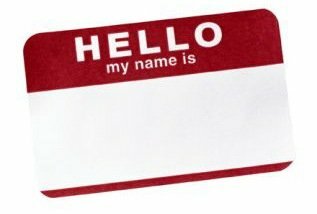 Don’t use the pre-printed “hello my name is” or “Visitor” nametags. Use the opportunity for church branding. I’d like to make at least a list of 10 – what would you add to this list? For more church hospitality tips on welcoming church visitors buy your copy of How to Welcome Church Visitors. As the final installment in our series on church nametags, here is a list I found from a church that chose to do this ministry. #10 A name tag is cheaper than a tattoo. #9 Wearing a name tag makes for a friendlier church. #8 You will be more approachable if you wear a name tag. #7 Even if you forget a name, you can still read it! #6 A name tag makes it easier to introduce you to someone. #5 A name tag makes visitors feel comfortable. #4 You can make a friend in less than 30 seconds if you wear a name tag. #3 You are immediately identified as an ambassador of our church. Friendly always wins. #2 Name tags are NOT about you. They’re about everyone in the world except you. #1 Everyone likes to hear their name! Source: St. Paul’s Evangelical Church newsletter. I’m not sure I agree with all of these 10 reasons to where a nametag at church, but they are things to think about.